Just because winter is on the way, it doesn’t mean that the season for enjoying flowers is over. 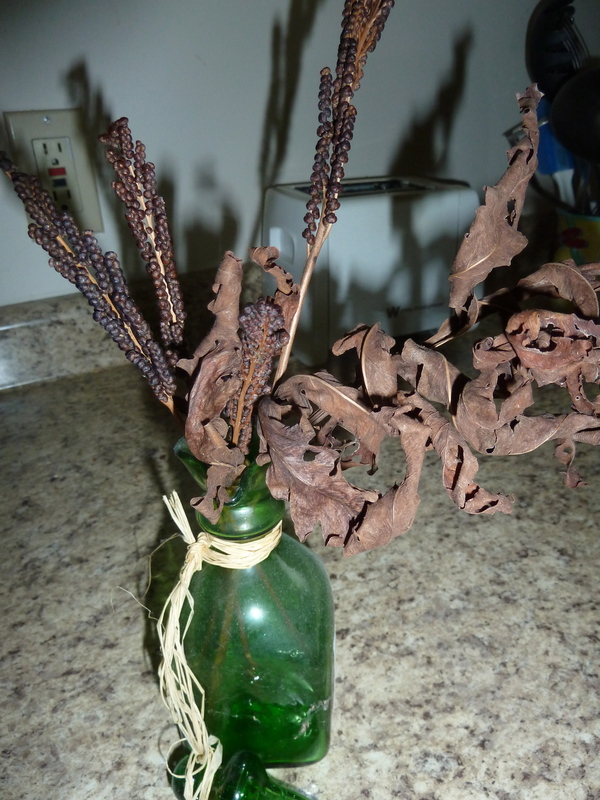 So many plants are as beautiful and interesting dried as they are when freshly picked. Zinnias are very easy to dry. I cut one or two flowers at a time and put them in a vase with no water. 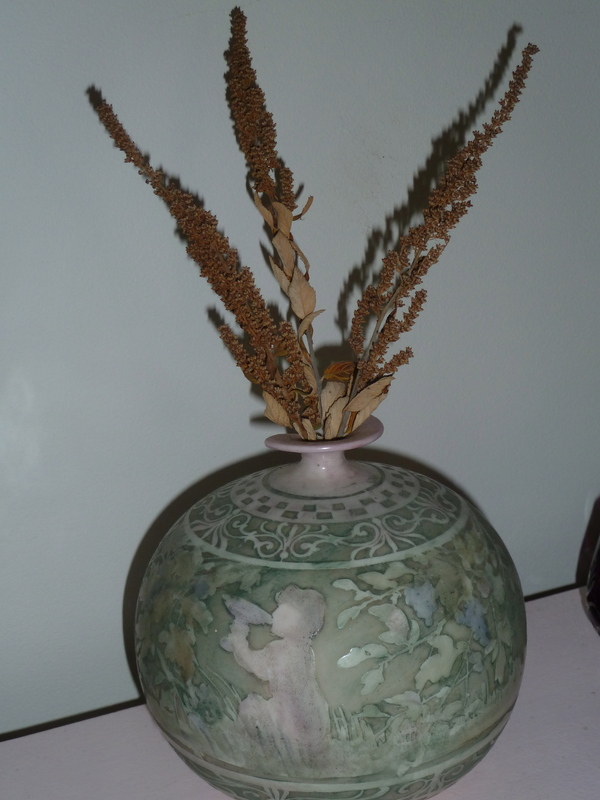 I cut the stems so the bottom of the flower head is the same height as the top of the vase. That way, the stem stays straight as the flower dries. 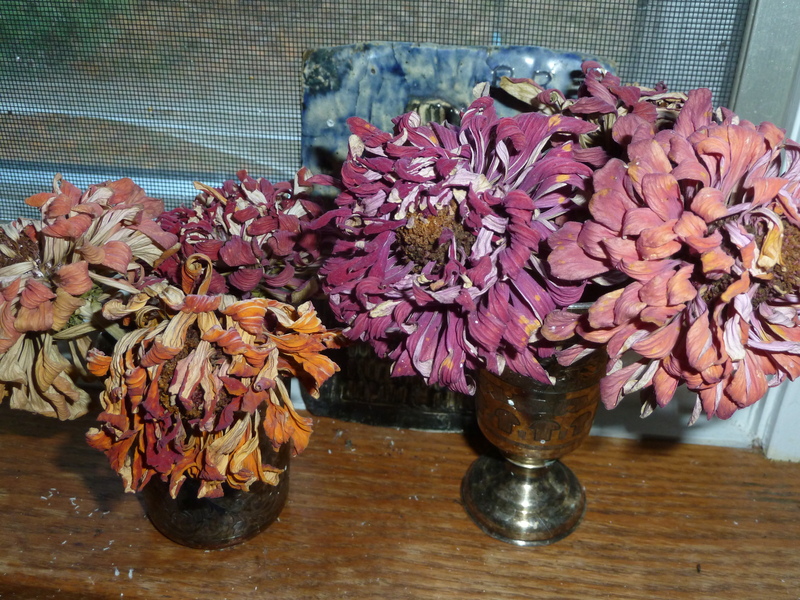 As you can see, the dried flowers are a bit duller than fresh ones, but they still retain a lot of color. I have these in vases all around my house. 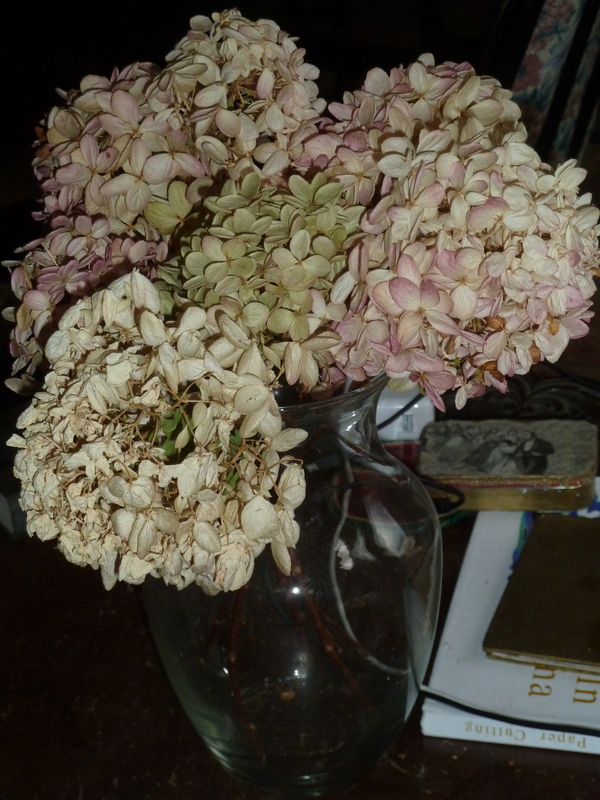 Hydrangeas also dry really easily, by the same method. 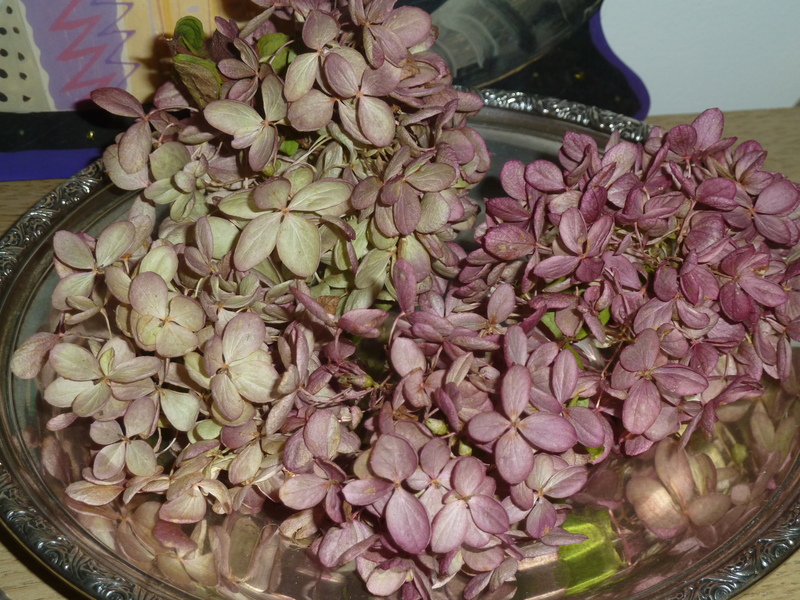 I cut these hydrangeas from the same plants. Earlier in the season they are white with a pink blush. Later they turn deep pink and green. Dried, they still have most of their original color. Here are some plants that lose their color when dry, but I enjoy their beautiful forms. This is steeple bush, a common wild plant around here. The fresh flowers are pink. 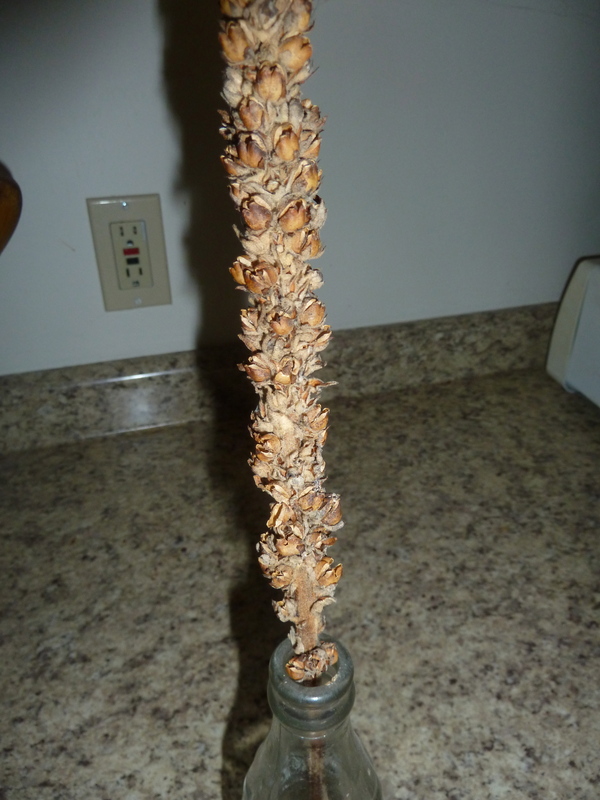 The flower stalk of common mullein. The fresh stalk is covered with green buds and tiny yellow flowers. Spore cases and leaf of sensitive fern. Although the chance for cutting fresh zinnias and hydrangeas has passed for this year, you’ll find dried steeple bush, mullein, fern spore cases, and many other beautiful wild plants in the fields and woods throughout the autumn, and even all winter, if they are in places where the snow does not get too deep. This entry was posted in nonedibles and tagged flowers, garden. Bookmark the permalink.